What's that extra crunch to the air? Is that the leaves swishing under our feet or the nip of wind on our cheeks? Either way, we can't help but skip around when we step into the cool autumn air. We get that some people dread cold weather. Summer fun is cooling down and the spooky weather isn't for everyone. What those people need is a reminder of everything that's unique about the fall season! What other season allows you to eat candy corn out of your sweatshirt pocket while hanging spiderwebs all over your house? Not a one. This is the only time of year that kind of behavior is socially acceptable. 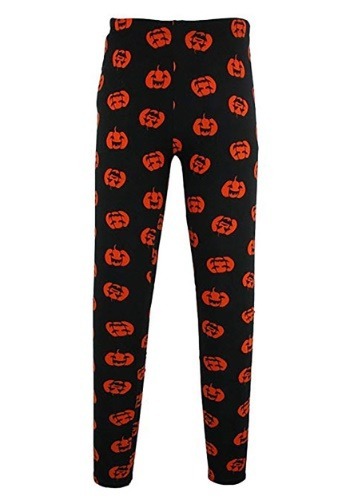 Go ahead and get your peers and neighbors as pump(kin)ed as you are with these sleek Jack-o-lantern leggings! Whether you pair these flexible leggings with a Halloween sweater or a sweet black dress, these pumpkin leggings will add a whole lot of fun to any Fall wardrobe. The waistband is stretchy, allowing you to move with the sleek ease that autumn deserves. Let everyone in your local coffee shop know that you deserve that pumpkin spice latte you're ordering when you flaunt these October-ready leggings. It's that oh-so-brief, oh-so-special time of year again and it's time to celebrate!